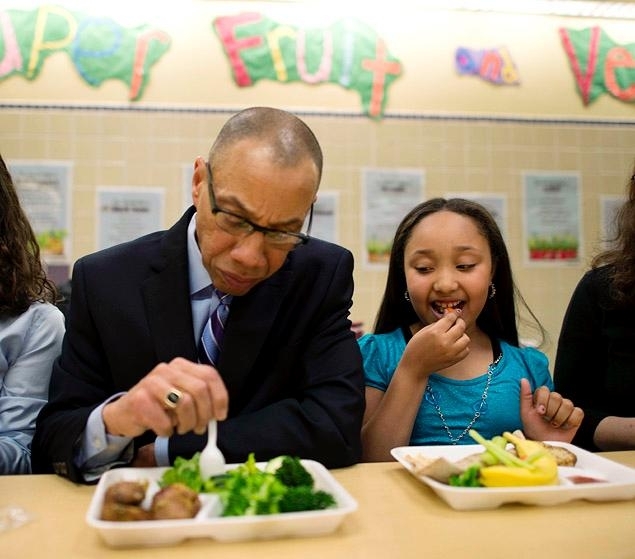 Schools Chancellor Dennis Walcott and student Arianna Francisco have a vegetarian meal together. America’s first all vegetarian public school has just started operating in New York City. We won’t hide our excitement. We hope that now that the ice has been broken, and positive reports from students are rolling in, that this will be the start of a new trend. “The founding of our school was based on health and nutrition and teaching kids how to make healthy choices, in the belief that they would be more successful academically and in their life,” Principal and school co-founder Robert Groff said. The School, which opened in 2008, gradually started offering vegetarian meals more and more days a week, reducing the days per week they served traditional cafeteria food like chicken nuggets. “But then we started to watch the kids; one, what they would bring in to school, and two, what they would gravitate towards in the cafeteria” Groff said. The switch to meatless — which the school did in partnership with nonprofit organization New York Coalition for Healthy School Food — was seamless. Many feel that New York’s bold move represents a ray of hope for the serious nutritional and health crisis children are experiencing. Unfortunately, France has taken a step in the opposite direction and it’s one that, if not overturned very soon, could hurt every student in the country, especially the vegetarian ones. A decree and bylaw, published in the “Journal Officiel” on October 2nd 2011, forces school canteens to respect a set of standards meant to guarantee the nutritional balance of the meals. Each meal necessarily has to contain a protein dish where proteins are exclusively animal-based (meat, fish, eggs or cheese), overriding the plentiful availability of vegetable proteins. A dairy product is supposedly necessary as the only way to cover calcium needs, ignoring untold vegetable and mineral alternatives. For meats (beef, veal, lamb, or offal…) and fish, a minimum frequency is specified as mandatory. So now it is impossible in France for regular school cafeteria users to be vegetarian on a consistent basis, and it is impossible to be vegan for even one meal. Vegetarian children, who may manage to leave the meat on the edge of their plate, are forced to have unbalanced meals, as no alternative can be provided. This decree appears to be a short-sighted political move designed to protect the French animal farmers, who have been scared by the success of speeches by famous people such as Paul McCartney, advocating eating no meat one day a week. Let’s hope there’s sufficient uproar by health and human rights advocates in France, for the politicians to see the folly of such a move someday soon!